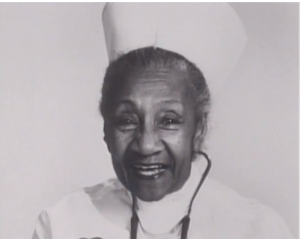 Alberta Hunter, one of the most influential jazz and blues singers of the 20th century, worked as a licensed practical nurse for over 20 years. Alberta Hunter was born on April 1, 1895 in Memphis, Tennessee. Her father, Charles Hunter, a Pullman porter, died of pneumonia in late February 1895, less than two months before her birth. Her mother, Laura Peterson, worked as a chamber maid at a Memphis brothel on Gayoso Street. Alberta was the third child of Laura and Charles Hunter. Her older brother John died shortly after being born. Her sister, La Tosca Hunter, was born in 1893. During her early childhood, Hunter lived with her maternal grandparents, Henry and Nancy Peterson at a house on High Street in Memphis. She was born at home and delivered by the same family physician, Dr. Albert Burchette, who had cared for her father. She was reportedly named Alberta after Dr. Burchette. Her maternal grandfather, Henry Peterson, died in 1899 when Hunter was 4 years old. Hunter and her sister attended Grant Elementary School in Memphis. By all accounts, Hunter had a difficult childhood that included sexual abuse by a number of adult men including the boyfriend of a landlord and a school principal. Her mother’s second husband, Theodore Beatty, was also reportedly violent towards both his wife and his stepchildren. 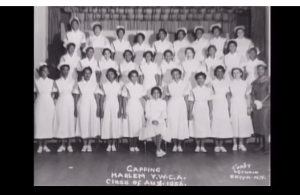 In 1909, when Hunter was 14 years old, her mother and her sister left Memphis and moved to Denver, Colorado. Hunter, who was then working as a laundress earning $1 per week, was reportedly devastated at being abandoned in Memphis. In 1911, after learning that singers in Chicago made as much as $10 per week, 16-year-old Hunter fled from Memphis to Chicago where she began working at a boarding house for $6 per week. Eventually, she began her musical career singing at a club in Chicago’s Southside owned by Francisco Cirofici, also known as Dago Frank. After Cirofici’s club closed, Hunter went to on to perform at renowned Chicago venues such as the Elite Cafe, the Panama Club and the Dreamland Cafe (later renamed Dreamland Ballroom) where she was accompanied by blues and jazz legends such as Louis Armstrong and Jelly Roll Morton. She then moved to New York where she became even more successful. In 1921, she was signed by the Black Swan record label and in 1922 she signed an exclusive contract with Paramount Records. However, around the same time she also recorded the same songs for five other record labels using various pseudonyms including Josephine Beatty, May Alix and Monette Monroe. She was also involved in theatre and performed in a number of Broadway plays. She went on to perform in both France and England and during WWII and the Korean War, she entertained U.S. troops as a USO volunteer. By the mid-1950s, Hunter appeared to have reached the pinnacle of her career and began preparing to do something else. As the Korean war had ended and young rock’n'roll musicians were becoming popular, there seemed to be few opportunities for an aging female blues singer in her late 50s. “I went as far as you could go. I played Broadway. I played the Royal Theatre in London. I played in Paris… and I figured I had gone to the top,” she told a documentary filmmaker in the early 1980s. 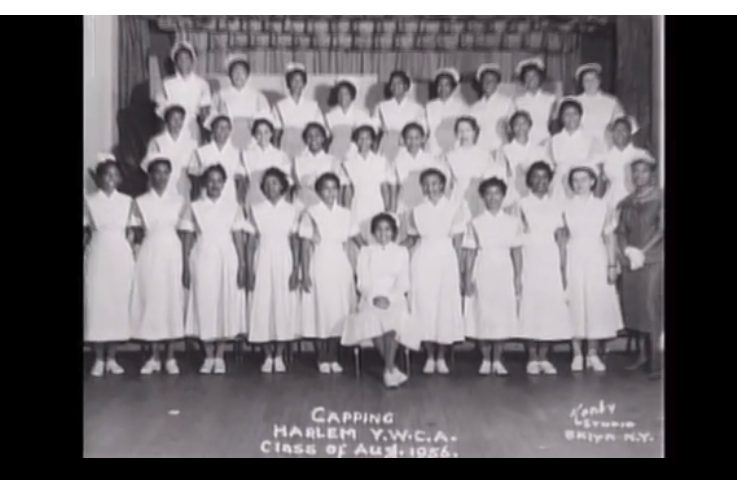 Apart from one recording in 1961 (“Songs we taught your mother” with Victoria Spivey and Lucille Hegamin and produced by Chris Albertson), Hunter did not publicly perform or record any music during the decades she worked as a nurse and most of her coworkers were ignorant of her musical past as she tried to keep it a secret. 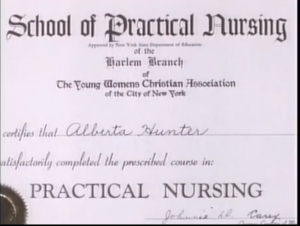 In a July 2003 report about the Broadway show “Cookin’ at the Cookery: The Music and Times of Alberta Hunter,” journalist Rob Pratt reported that Hunter’s musical career “was certainly a big surprise to her colleagues from the hospital.” “When you saw Alberta walking around the halls of Goldwater [Hospital] starched and crisp in her uniform, you would never think that she could get up there and be so risqué and flirting,” fellow nurse Mildred Crisp Littles told Hunter biographer Frank C. Taylor. I was the most hurt person in the world when they retired me from the hospital. You know, they give you… 65 is mandatory to retire.. Well, they gave me 5 more years, they thought I was 70. When they retired me, they thought I was 70. I was 82. They all recognized me because I tried to be so good to them and if the time was up and my patients were restless, I stayed right there and tried to soothe them to sleep before I could go home and that learned me how to try to be kind to my fellow man. After retiring as a nurse, Hunter began a second musical career and, in October 1977, began performing at the Cookery in Greenwich Village at the insistence of Barney Josephson. On October 6, 1978, Tennessee Governor Ray Blanton declared an “Alberta Hunter Day” and Memphis mayor Wyeth Chandler presented her with a key to the city. In December 1978, she was invited to the White House to perform for President Jimmy Carter. In 1978, she was also signed by Columbia Records and went on to record four more albums before her death on October 17, 1984. In 2011, Hunter was inducted into the Blues Hall of Fame.